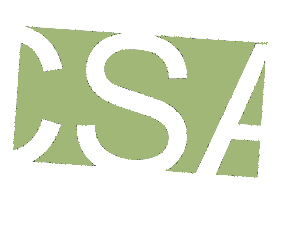 Non-Member price: If you join, you may use $20 toward the $275 annual membership for 2017. Can Facebook, Twitter, LinkedIn, Instagram, Google+ and YouTube really make your staffing firm more successful? YES! If you know what to do. Social media is about establishing your voice, building connections and MAKING MORE PLACEMENTS! But, with the social space rapidly evolving, where do you get started? Where should your sales team and recruiters invest their time? 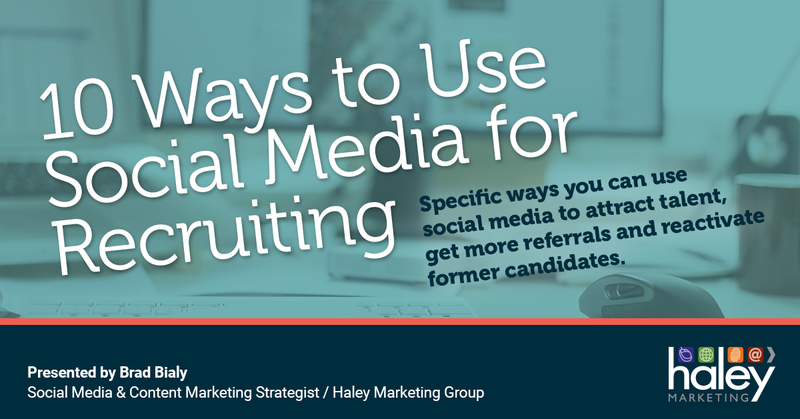 In this session, we'll look at specific ways you can use social media to attract talent, get more referrals and reactivate former candidates. You'll take home 10 (at least) ideas that you and your team can start implementing right away! 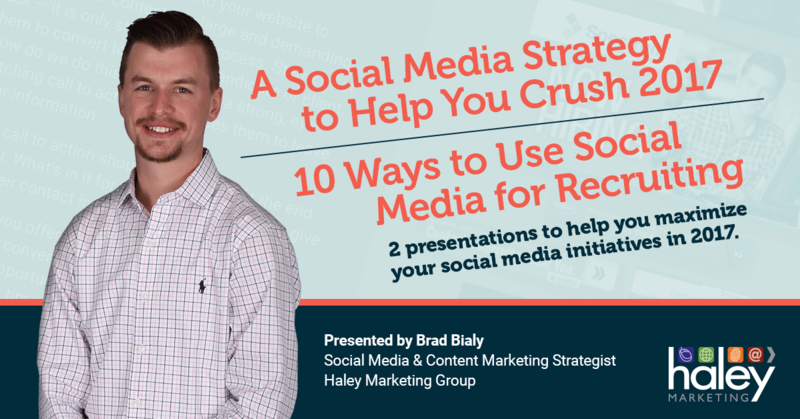 Brad Bialy is a Social Media and Content Marketing Strategist at Haley Marketing Group, the nation’s largest marketing firm dedicated to servicing the staffing and recruiting industry. Brad has four years of experience in the staffing and recruiting industry, helping organizations develop and implement strategic digital marketing plans to reach defined business goals. As a digital marketing expert, Brad has advised nearly 60 staffing and recruiting firms with social media marketing, blogging, content marketing, email marketing and search engine optimization. He has guided the strategy and delivery of multiple industry award-winning social media campaigns. Brad oversees and implements the comprehensive social media marketing campaign for Haley Marketing Group. He is a consistent contributor to Lunch with Haley, Haley Marketing’s educational webinar series for the staffing industry, and has presented at past industry-specific conferences.